I am no authority on suicide. I have no degree or license in counseling. I have no training. I have never been on the receiving end of a hotline. I have never seriously considered suicide (suicidal ideation is not the same). Nor have I ever helped a friend live to the other end of a suicide attempt. No one I have ever been close to has died from suicide. No one asked me for my opinions on suicide and absolutely no one should take my ideas as fact. I am emotionally affected by the suicide of Robin Williams, like all children of the ’90s. 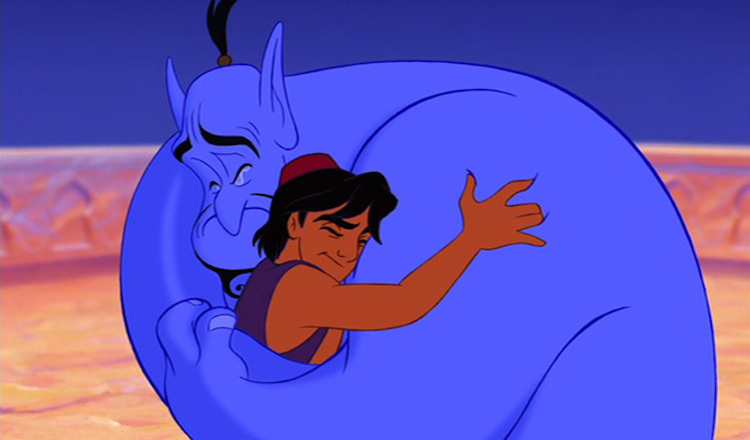 For me, he was the charismatic Genie from Aladdin, primarily, but also Mrs. Doubtfire, older Peter Pan, the man stuck in Jumanji, and the wise psychologist from Good Will Hunting (the counselor we all wished we could find to guide us out of our own mental anguish). With the exception of Mrs. Doubtfire,these movies have strong moral messages: keep your promises, go for your dreams, don’t overlook the blessings you already have, money and prestige aren’t what’s important, love and cherish your family. Robin Williams’s many voices were voices of good and truth. Some people say that those who die by suicide are selfish, but my understanding is that the dead believed it was the best option they had available, and a way to relieve not only their own suffering but they suffering they perceived they were causing others. I doubt many, if any, did it to cause more pain to others, although certainly they must have anticipated that it would cause grief. I wonder if Robin Williams knew how many people would consider his suicide to be their own death sentence. When the voice of good and truth from our childhood gives up, who can we rely on? still can’t help thinking: if a guy with all the talent and success in the world couldn’t beat this, what chance have i got? Many of my loved ones suffering from depression and bipolar disorder, among other mental illnesses, are wondering if they can make it. If someone so successful and universally loved didn’t want to live anymore, how can we commoners keep going? We were told that once we made it out of our teenaged years it would get better. Maybe, if we got to be real adults with careers and partners and maybe houses and children, we would feel stabilized. With a job that brings in decent pay, an enthusiastic lover, a sturdy support network, health insurance, and a little help from antidepressants, I feel pretty solid. But what comes with the aging process? Are there dark clouds on my distant horizon that no one wants to warn me about, the point in a person’s life when everything gets worse? Aladdin didn’t want to give up Genie because he wasn’t sure he could have the life he wanted without magical intervention. When Jafar captured Genie, Genie become a slave to his new evil commander. I’m stretching this into a metaphor about depression, where Jafar is depression. Genie can’t help you anymore. You’re going to have to defeat depression without him. I want to point you to this wonderful comic about Robin Williams’s suicide by Erika Moen, I Want to Live. Updated: Robin Williams’s wife has released a statement that he had Parkinson’s Disease, which can severely affect the mind as well as the body. The disease may or may not have been exacerbating his depression, but it’s comforting to think that it might have been part of the cause of his decision to end his life, that it wasn’t depression alone.